Come see what everyone is smiling about. Beautiful Facility. Frendly Staff. State of the Art Equipment. Family Environment. Dr. Jennifer Holland Wayer is a third generation native of Crestview and a graduate of Crestview High School. 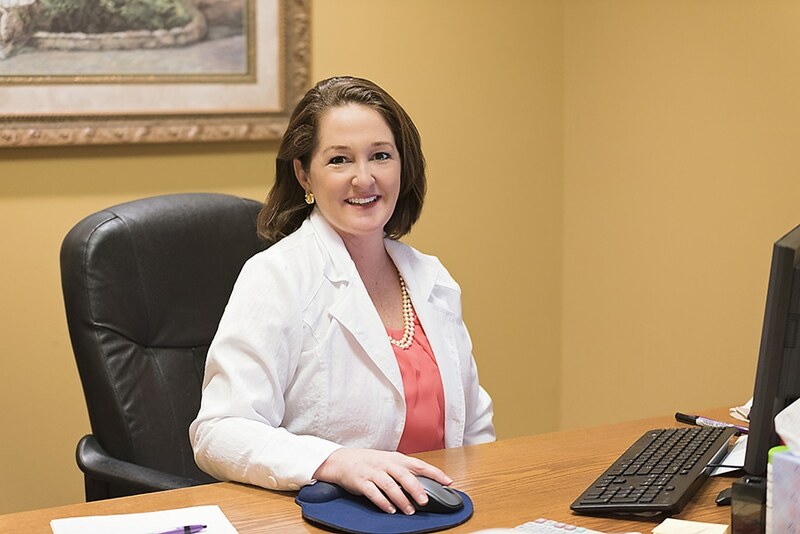 Dr. Wayer acquired her Associate Degree at the University of Florida, then her Bachelor Degree at the University of South Alabama. Dr. Wayer completed her Doctorate Degree of Dental Medicine at the University of Alabama at Birmingham in 1999. She resides in Crestview with her husband and four children. Dr. Wayer’s mission is to provide patients exceptional dentistry with the most advanced techniques and latest innovations in the dental field. Dr. Wayer believes all patients deserve to be treated with honesty, respect, compassion, and empathy. She strives to provide a warm, personal, and comfortable environment and to be the best care-giver she can be to each and every patient. It is her goal to improve each patient’s quality of life by providing excellent and heartfelt care.. Check out our Facebook, and see what others have to say! Our hygienists remove stains with an air-polishing device, which sprays a combination of air, water, and baking soda. They polish teeth with a powered tool that works like an automatic toothbrush. Our hygienists also help patients develop and maintain good oral health and also give advice to patients on how to select toothbrushes and other oral-care devices. Smile enhancement can have dramatic results on your overall appearance; even the smallest step can boost your confidence, self-esteem, and make you want to smile more. With modern advances in dentistry, cosmetic procedures can range from a basic color correction to replacing missing teeth, and everything in between. Tooth restorations are the various ways we can replace missing teeth or repair missing parts of your tooth structure. Tooth structure can be missing due to decay, deterioration of a previously placed resin, or a fractured tooth. We offer tooth colored fillings as an alternative to the traditional dark, metal fillings, as well as metal-free, esthetic crowns. We also provide both partial and complete dentures. Dentures can be made prior to tooth removal if desired. We offer traditional metal frame removable dentures as well as metal free and flexible varieties. Same day denture reline and repair are often possible. Our goal is to provide you with a beautiful confident smile..